Unique fresh resin! For centuries the Indians of the Amazon have been turning on with a variety of hallucinogens that come to them through the courtesy of Mother Nature. One of the fastest-acting of all is Epena. Epena is prepared from scrapings. of the red resin beneath " the k of the Virola calophylla tree, a member of the nutmeg family native to the rain forests of Columbia and Brazil. After the resin has been thoroughly dried, it must be crushed td a fine powder, mixed with ashes, and snorted in a manner similar to commercial snuff. The active constituents of the resin has been shown by recent studies to be an exceptionally high concentration of tryptamine alkaloids in the resin. Waikᠳnuff prepared exclusively from the resin of Virola theiodora has up to 8 percent of tryptamines, mainly the highly active 5-methoxy-N, N-dimethyltryptamine. Two new alkaloids of a different type --, B-carbolines -- have also been found in the resin; they act as monoamine oxidase inhibitors and make it possible for the tryptamines to take effect when the resin is taken orally. It takes 40 litres liquid resin to make one kilo of dry resin powder! The epena trip lasts about thirty minutes. Its powerful offacts are virtually instantaneous. The half-hour excursion floats the tripper through a variety of sensations, including perceived color and size changes in objects, and an intoxicated, dizzy feeling combined with. a sense of increased alertness and clear vision. Euphoric, pleasant feelings, along with a sense of light stimulation, may continue for several hours after the more dramatic effects of the trip have subsided. Because the drug severely irritates the mucous' membranes of the nose, it often causes the user to sneeze uncontrollably. To avoid that part of the experience, natives have been known, to mix their snuff with water and use it as an enema to get off: A hallucinogenic cousin of epena, called cohoba, has been made from the pulverized seeds of Anadenanthera colubrina, also known as Piptadenia perigrina. Sold as incense by law! 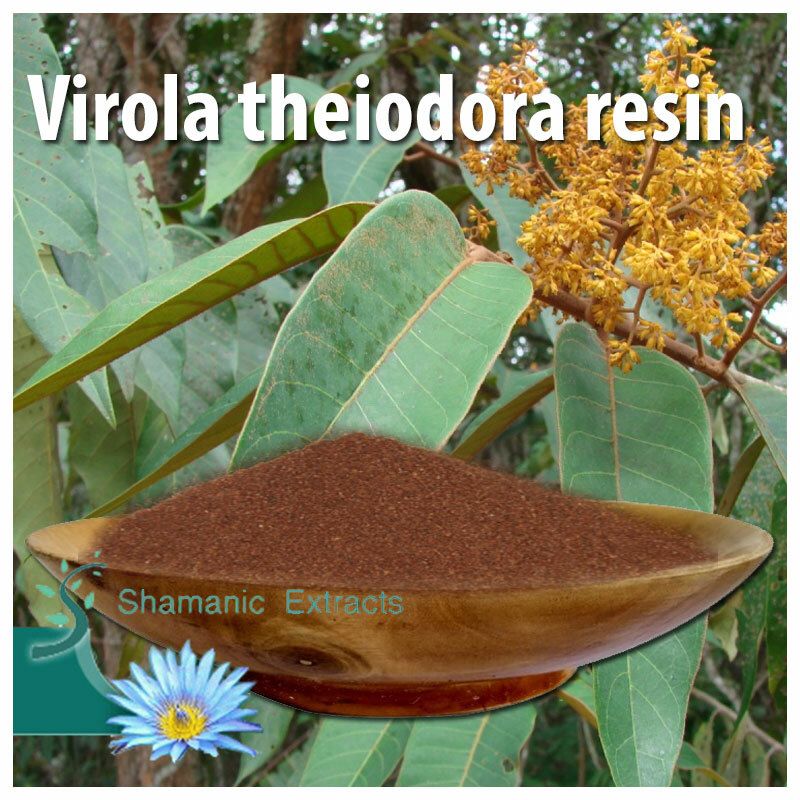 Share your experience about Virola theiodora resin with other customers. Submit your tips or thought on this product, be detailed and specific.